Eugene Ysaye (1858-1931) was during his lifetime one of the most acclaimed violin virtuosos alive, known by many as the "king of the violin". He also composed works to showcase his virtuosity. The Six Sonatas for Violin Solo, Op. 27 (1923) is one of the most demanding and beautiful of his works. 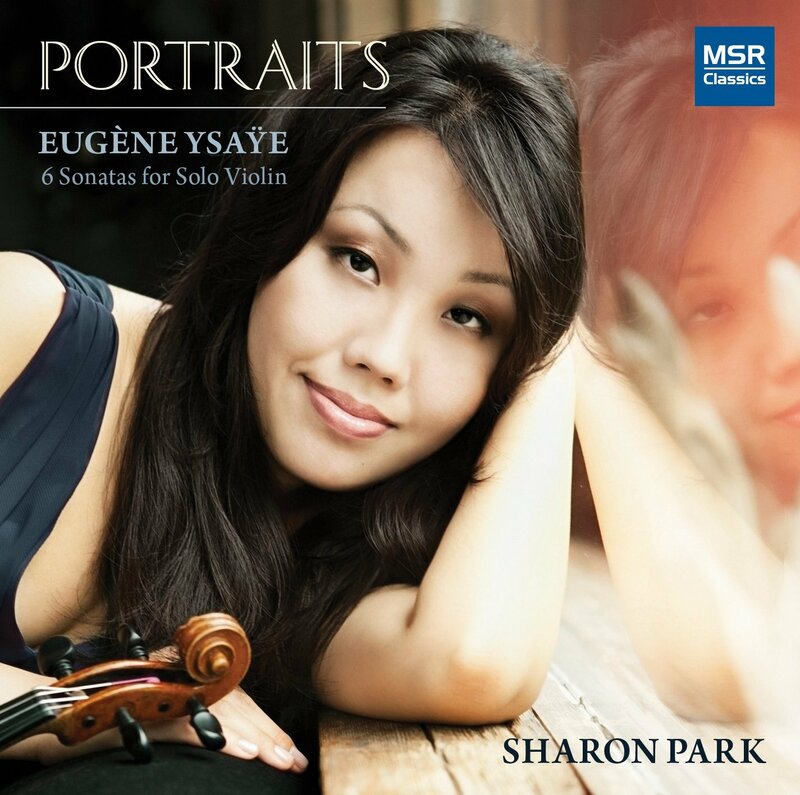 Violinist Sharon Parks brings us a detailed and impassioned reading of all six on Portraits (MSR Classics 1631). The demanding and bravura music is basically an embodiment of the expressive romantic solo violin tradition that goes especially back to Paganini but shows the sure hand and originality of Ysaye. 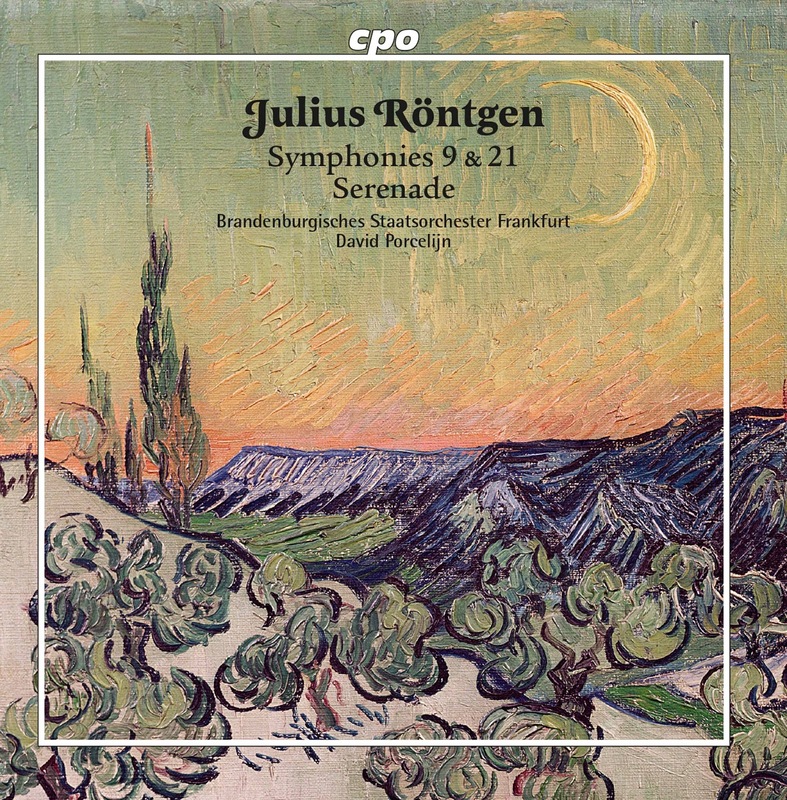 Unlike Reger's solo violin work it does not often directly show roots in Bach, although there is a genetic relation, an occasional quotation and a general spirit that goes back to Johann. The sonatas do also generate more extroverted declamations in the manner of concerted cadenzas typical of the showcase works of the 19th century. Nonetheless the sonatas were initially inspired by hearing Joseph Szigeti play Bach's Unaccompanied Sonatas. There is a supreme seriousness of purpose that evinces much more than technical feats. It is superior violin virtuosity that never short shrifts content. Each sonata is dedicated to a violin virtuoso of Ysaye's day and in part reflects a response to each violinist's way of playing. So there is one sonata each dedicated to Szigeti, Jacques Thibaud, Georges Enescu, Fritz Kreisler, Mathieu Crickboom and Manuel Quiroga. Sharon Park meets the challenge of this set in the most musical ways, showing a polish and a substantial dash of flamboyance very suitable to the music. It is for her a definite triumph. I for one am very glad to have her readings. If serves as a sort of definitive view of these important works. 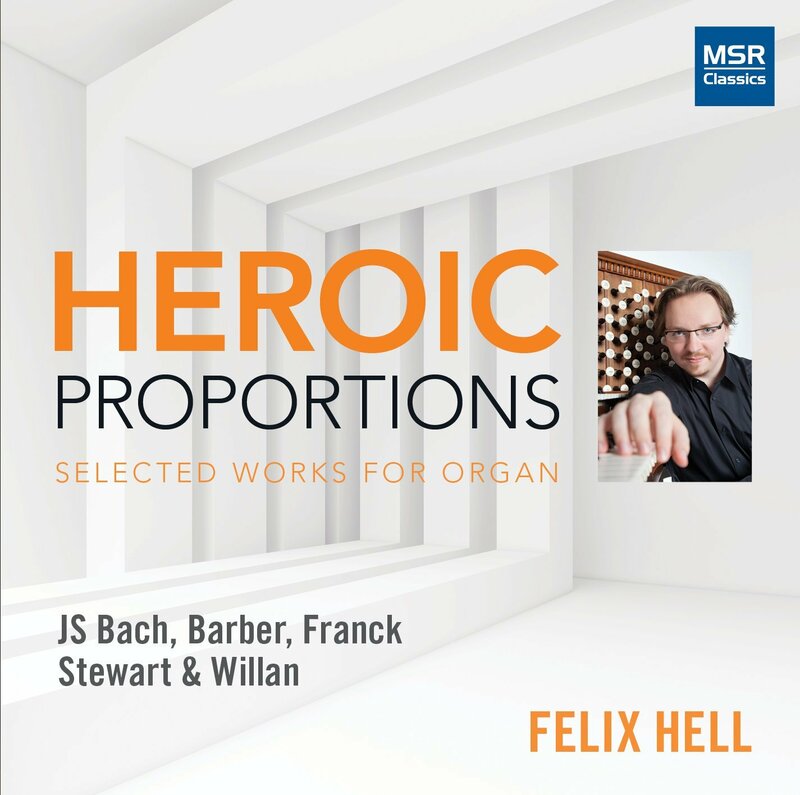 Those who appreciate the organ music repertoire will find Felix Hell's Heroic Proportions (MSR Classics 1542) of interest. It is a wide-ranging selection of works spanning wide period and style sets, with as the title suggests a heroic organistic flourish at the forefront much of the time. The common link throughout is the fine artistry of Felix Hell. He gives each work a detailed and very worthwhile reading. The Bach "'St. Anne' Prelude and Fugue in E-flat Major" has the stately seriousness of purpose one might expect. And the Franck "Piece Heroic" (1878) brings an epic, determined dimension into play. William Strickland's organ arrangement of Samuel Barber's beautifully melancholy "Adagio" translates the string parts to organ with dramatic intelligence. It must be heard closely, however, as its subtlety demands your attention. Lastly we have two lesser known works , the World Premier Recording of Eric R. Stewart's "Sonetto" (2012) and Healey Willan's "Introduction, Passacaglia and Fugue" (1916). The Stewart work has modern fireworks and heroic dash. The same can be said for the Willan, with the nearly 100 years between the two works a factor the ear can recognize without trouble. And so Felix Hell brings us a substantial recital that all organ enthusiasts will appreciate. 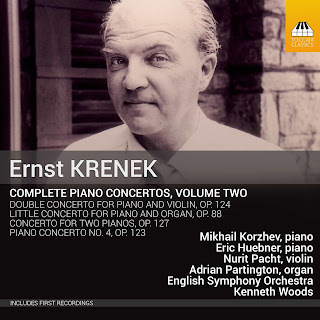 A composer as long lived (1900-1991) and as productive as Ernst Krenek may in the end suffer neglect in the years following his death. And then as time moves on he may happily be subject to re-evaluation. The positive sign of that is in a welcome survey of his Complete Piano Concertos, of which today I report in on Volume Two (Toccata 0392). It is a finely honed interpretation of four of the seven works that make up the total, featuring Mikhail Korzhev and Eric Huebner on pianos, additional soloists as needed, and the English Symphony Orchestra under Kenneth Woods. Krenek was one of the master high modernists of last century, but perhaps more recognized as a cutting-edge force in the earlier days of his career. Blame that no doubt on the upheavals in Europe beginning in the thirties, leading to unspeakable degeneration and savagery in the years following. Three of the concerted works in the volume stem from 1950-51; the other is from 1940. 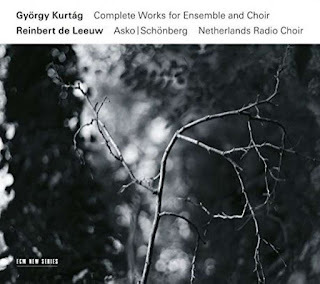 All are finely wrought masterworks that combine a personal approach to serialism and non-serial elements, the latter of a characteristic and local thematic sort. The "Piano Concerto No. 4, Op. 123" (1950), in first recording incredibly enough, has a remarkable balance between piano assertions and orchestral weight. The far reaches of modern harmonic possibilities prevail, yet the orchestrational and expressive structures bring forth a highly accessible discursive fluidity. The "Concerto for Two Pianos, Op. 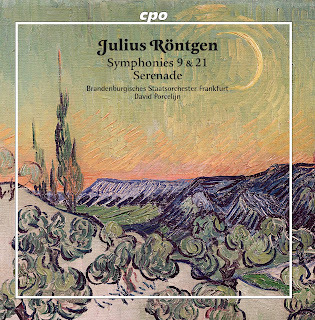 127" (1951) alternates a dramatically thickened density at times, thanks to the two-pronged solo possibilities, with quieter luminescences that evoke a sort of hushed twilight feel.This is another most welcome first recording. As the listener segues to the "Double Concerto for Violin and Piano, Op. 124" (1950) she or he finds a different balance of expression made possible by the two emotional and aural dimensions available via the two solo instruments. An elaborate three-way dialog between violin, piano and orchestra acts as a brilliantly transparent window into a sonic landscape that moves continually between the three poles of musical discourse. 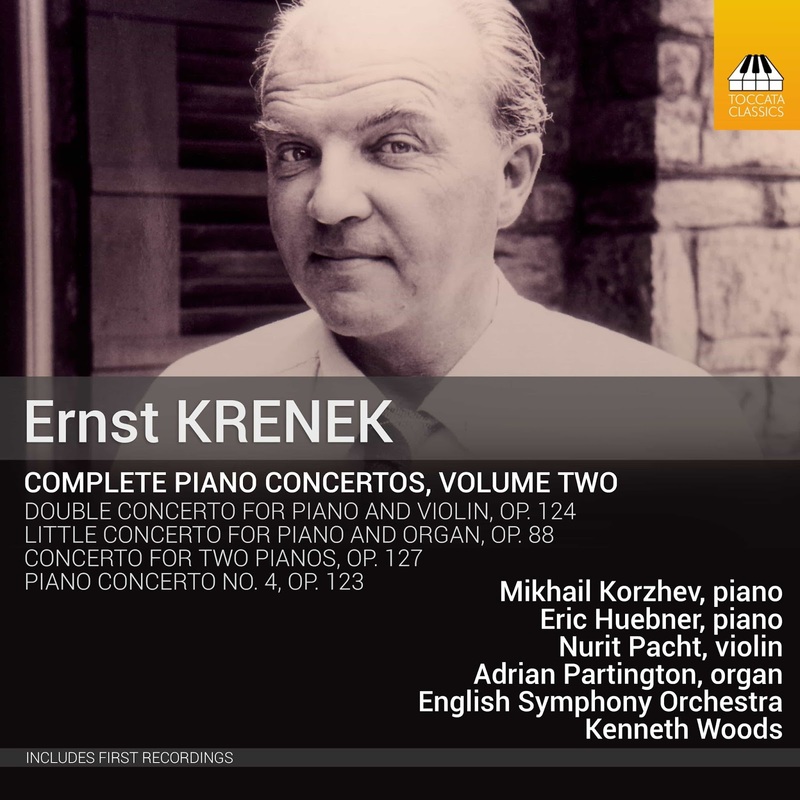 This third and final first recording of the volume once again alerts us to how fully mid-century Krenek was in control of the expressive spectrum available in the concerted form. The final, brief "Little Concerto for Piano and Organ, Op. 88" (1940) unveils yet another sonic brilliance, with piano and organ fleshing out a tandem singularity that expresses much in the most compact ways. In sum this volume is a treasure of Krenek at a mid-century peak. The music is invariably excellent and moving. That so much of it is virtually unknown today is all the more reason to obtain this volume and listen deeply to it. The human animal is imitative. From infancy on, we learn to mimic the humans around us. And in every adolescent there is the world of imagination and creative singularity. Composers who are worth their salt manage to imitate and then enter a personal world of their own making. Julius Rontgen (1855-1932), a Netherlandish symphonist, does not enjoy a wide currency in today's concert world. Yet judging by the recent recording of his Symphonies 9 & 21 and his Serenade (CPO 777 120-2) he stands out as one who has worked through imitation and found a way to be original, at least sometimes. The Brandenburgisches Staatsorchester Frankfurt under conductor David Porcelijn bring to us careful and nuanced readings of the three scores. The "Semmering Serenade" is the earliest representative work, hailing from 1902. It marked his late entrance into large scale orchestral composition, though several youthful symphonies were under his belt by 1875. Apparently he destroyed them sometime after. The "Serenade" has some beautifully alive, long lined lyric melodics. The "Symphony No. 9 'Bitonal'" (1930) has an elusive way about it. It does not exactly sound "modern," and indeed Rontgen did not find that the modern ways of his time suited his own sensibilities. Instead a kind of feelingful inspiration was his approach. There is a residue of romanticism to be heard here and elsewhere, but like Grieg and Sibelius it was but an idiom to allow inventiveness free reign. The "Bitonal" Symphony oscillates between centers. It is more a continual modulation between key polarities than a simultaneity of two keys at once as in Milhaud. Rontgen's bitonality is a linear trajectory between two key centers. Never does the bitonal twain meet. The mysterious and the characteristic are more at the forefront than a sort of tonal assault. Sometimes it feels like a continual developmental section of sonata form and a transition that does not transit in the end. Nothing wrong with that, really. It is fascinating music. The "Symphony No. 22" has much charm and an orchestrational luminescence which somehow channels Brahms and Mendelssohn into the 20th century. In this Rontgen asserts himself as a consummate craftsman of neo-romantic pastoral pasturization? Yes. A man out of his time, no doubt, but if we forget that it does not matter. Interesting and well-fashioned symphonics. And for that there is much pleasure to be had. Lou Harrison belongs to that stubborn, iconoclastic Yankee school of last century that began with Ives and Ruggles and continued with Harry Partch, Cage, Henry Cowell, Henry Brant and Harrison himself. Harrison refused tamely to submit to the requirements of "Western" modern classical as defined in his lifetime. He was one of the more dramatically effective and inventive proponents of an "East-Meets-West" eclectic originality. We hear this all very clearly on a well-realized three-work anthology. 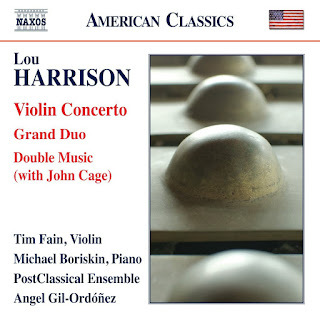 Violinist Tim Fain, pianist Michael Boriskin and the PostClassic Ensemble under Angel Gil-Ordonez bring to us a well finessed reading of Violin Concerto, Grand Duo and Double Music (with John Cage) (Naxos 8.559825). Fain has the right combination of rhapsodic projection and modern sonar facticity. The same might be said in pianistic terms for Michael Boriskin. The PostClassical Ensemble handles the various percussive and chamber requirements of the composer with a bit of dash and aplomb. These are all nicely representative of Harrison at his finest. The Grand Duo (1988) is perhaps the lesser known of the three works and in some ways it brings us a Harrison slightly more integrated into Western classical tradition. That is, on the surface. Listen to the subtle interweaving of violin and piano parts and you will recognize something of the Harrison world expansiveness. It all takes place though in a more quietly underscored expressive way. On the other hand the Violin Concerto (1940-1959) uses a percussion chamber group to suggest the more exotic allusions to gamelon and other non-Western music, which the violin in turn takes on with acute extroversion and seamless expressivity. Harrison and Cage's breakthrough percussion work Double Music (1941) makes a decided break with Western norms to create an analogic new music entranced with and entrancing the non-Western elements that make a clearing and at the same time give momentum to the idea of New Music for percussion ensemble, which at that time was a very new idea. The lines intermix and continually vary within and against themselves. This is a fabulous version that stands out among the many recorded. It is that for its most musical approach, the way every phrase presents itself with great tensile strength and the near ghost of a rubato that applies torque and makes it all "swing," if you'll pardon a borrowed jazz term. All told the Naxos release brings to us seminal Harrison played with ideal sympathy, creative fervor alternating with expressive quietude. The Naxos price helps make this CD well nigh irresistible. Music that turns out as, or even more evocative than its title suggests leaves us transported, if all is right. 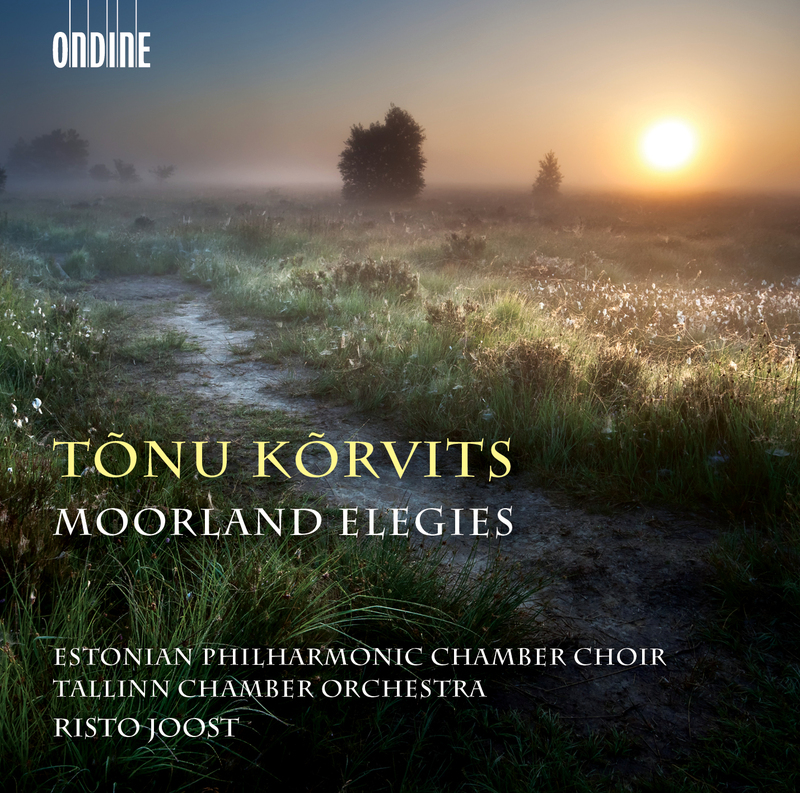 That ends up how I feel about Tonu Korvits's Moorland Elegies (2015) (Ondine 1306-2). It is a nine-part work for mixed choir and string orchestra. The texts are poems by Emily Bronte. 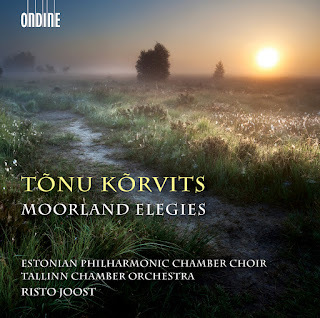 The Estonian Philharmonic Chamber Choir and the Tallinn Chamber Orchestra under Risto Joost give to the score all the potentially moody ambience that is inherent in its beautiful tone painting contents. It has some similarities with the ambiances of fellow Estonian Arvo Part. It partakes even more in a haunting after-modern impressionism so that it readily serves as a contemporary model of what can be done. Korvits himself says of the work that it is a journey "into the darkest, most mysterious corners of loneliness to where one doesn't dare peek twice." Composers are apt perhaps to wax hyperbolic about what a work purports to do. In this case though, it is almost an understatement. The eerie poetic revery builds sonic worlds that have the capacity to poetically transfix, and they do so without release. It is the sort of work that silence or any everyday sound you hear after the work has ended takes on the coloration of the music the remains in the active imagination. Moorland Elegies colors your world so thoroughly that for some time afterwards nothing seems to return to the crisp mundane everydayness that you normally operate within. What can be said musically can rarely be said so well that there is no mistaking its content. Moorland Elegies does this in magical terms, where that which is concrete in its building blocks transforms into an ethereal presence and an ever-liquidian flow that refers back to long stretches of vegetative leveling, wind that states its disregard of human presence, and the totality of being utterly alone within such a world. To say it eschews a romantic sentimentality is the case. It instead gives forth with an "after all, this is what remains" kind of dynamic finality. There is the mysterious ineffable quality of Ives' "The Unanswered Question." This work gives us the unquestionable answer. That in the end is the historically positioned subject at a point where all the hurly burly of past experience disappears into a haze of not-self. There is singularity of purpose and rare totality of tonal imagery to be heard on this recording. To listen is to enter a world where we matter by disconnecting from the world outside of the desolate moor-scape and immersing ourselves fully in its facticity. Nothing quite has this titanically fragile moodiness. It is a world that is post-pastoral, way beyond the nostalgia for a lost world, but rather a lost-in-the-world solitude. All is what it is, and that is regretful in its beauty. There is more I could say. The main thing is how the music stuns by an uncanny analogic juxtiposition of subject-text and tonal refractory magic. Who "owns" Western Civilization? The answer is everybody. For the classical music canon, for example, anyone is encouraged to listen, anyone to perform, anyone to devote a life to it or just let it ornament their existence. That J.S.Bach is German is a fact. Germans look to him with pride, yet he belongs to the entire world. It is true in the end of all music. That L.A. born pianist Karin Kei Nagano chooses to perform Bach's Inventions & Sinfonias (Analekta 2-8771) is wholly a part of the picture. She is a very talented artist, completely steeped in classical tradition and performance practices and yet she also gives us crisply poetic interpretive versions of these masterworks that inject her very own sensibility. This is how it should be. If in my opening lines if I say the obvious it is only with a righteous indignation because of what local White Supremacists have been doing: attempting to hijack the world's cultural heritage to serve their own evil agenda. (Among other unspeakable things.) It will not stand. So as it happens Bach's Inventions & Sinfonias (BWV 772-801) are gems of the highest order. Yet Bach simply wrote them for his family and students as a pedagogical device to enable them to gain fluency on the keyboard. In the process he created a set of contrapuntal works that mark his genius as surely as anything he ever wrote. If you took classical piano lessons the chances are good that you learned them. If you did or did not matters little in the end, since Ms. Nagano plays them all with great interpretive sensitivity so that they all sing out in all their glory. She does not generally take things at a maddening clip. Instead she seeks to bring out each part with clarity and poetic poise. Wonderful versions of wonderful music. Time and identity virtually cease to exist when listening. Nearly every day lately I am surprised to hear something unknown and unexpected. Today's classical-modern selection clocks in and it's another I never might have known were it not for the CD playing now on my player. I speak of the World Premiere Recording of something by Stephen Dodgson (1924-2013). 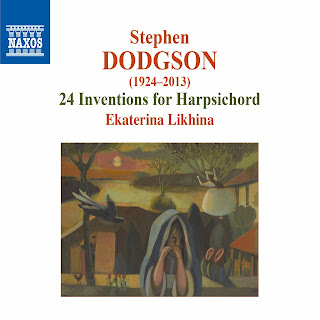 Namely we have Ekaterina Likhina playing Dodgson's 24 Inventions for Harpsichord (Naxos 9.70262). Stephen's widow has been on hand, happily, to guide Ekaterina Likhina on tempo, notation and character. The resulting performances sound to me definitive. Liners say that these Inventions are among the most important works for harpsichord in our times. Based on the more well known modern works I have heard repeatedly I would have to say that these compare most favorably. There is much excellent music to absorb. The complexities and inventive detail in these works demand multiple and unsuperficial hearings to grasp fully. It is worth the trouble, since in the end there is a great deal to like! 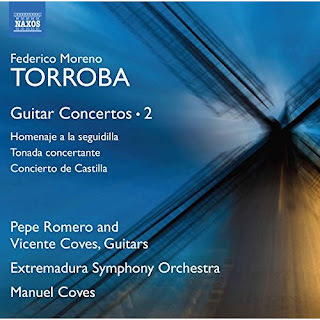 Last February 13, 2016 I reviewed on these pages the first volume of Torroba (1891-1982) Guitar Concertos featuring guitarists Pepe Romero and Vincente Coves, with the Malaga Philharmonic under Manuel Coves. We now contemplate the second volume (Naxos 8.573503), with all the same save the appearance of the Extremadura Symphony Orchestra. For the second outing Pepe Romero handles the solo duties on "Homenaje a la seguidilla" (1962) and the "Tonada concertante" (1975-80). Vicente Coves takes over for the "Concierto de Castilla" (1960). Romero's pupil Vincente Coves plays as beautifully as his mentor. The Extremadura Orchestra sounds every bit as idiomatic and vibrant as one would hope for in this music. The music is captivating, with Castilian-Spanish folk elements vying with a kind of neo-impressionist shimmer and lyricism. The solo guitar parts have bravura and introspection at the forefront alternatingly. The three works that comprise Volume 2 of Torroba's Guitar Concerto outing continue the wonderful fare and make for a beautiful listen. I heartily recommend it. Living Australian composer Mark John McEncroe came to composing relatively late, spending his 20s and 30s as music label manager for EMI Australia and then EMI Sweden. He returned to Australia and began in earnest piano studies, clarinet studies and eventually theory and composition, the latter with Margaret Brandman from 2003 to 2012. He began composing a number of symphonic poems with orchestration help from Mark Salibus, with whom he continues to study. Earlier this year Parma Records released a recording of Mark John McEncroe's "Natalie's Suite" for orchestra along with several solo piano works. 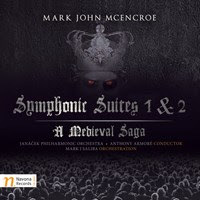 The present release continues the relationship with a two-CD recording of the Janacek Philharmonic Orchestra under Anthony Armore performing McEncroe's Symphonic Suites 1 & 2: A Medieval Saga (Navona 6116). The orchestration is handled deftly by McEncroe's mentor Mark Salibus. There is a series of thematically intertwined continuities that serves to unify both suites into a cohesive whole. The two suites musically depict a story of Middle Age political upheaval and its aftermath. What strikes me most on hearing and rehearing the lengthy two-part work is the way the sprawling unfolding of the score in a consistently minor mode serves to put this music into a kind of timeless world zone. It has a sort of mysterious east-meets-west aura about it. Indeed, its minor ornamental continuity reminds me a little of some of Hovhaness's more Armenian tinged works, only with less focus on a specific region or time and perhaps more of an alternate contemporary-in-archaic mode that straddles a wider set of allusions. One is left with a singular impression of a kind of organicized stylistic unity and flow that places the music outside of time yet also anchors itself fully in a post-modern kind of present. It transcends a typical pomo vision by unfolding more according to modal-flowing, flowering lines that allude to early music melodic expression without actually quoting or directly assimilating it. I am left with an impression of something complete unto itself yet rather thoroughly outside contemporary modern music currents. It virtually stands apart from any modern mainstream realms yet in the end reflects our times as through a lens into the past. Something entirely different, this is. Any adventurous soul may well readily take to this music as I have. Happily recommended. Of masterful baroque composers there are seemingly more than a few who for whatever turn of fate we have nigh well forgotten. Today we have an instructive example in Johann Mattheson (1681-1764). 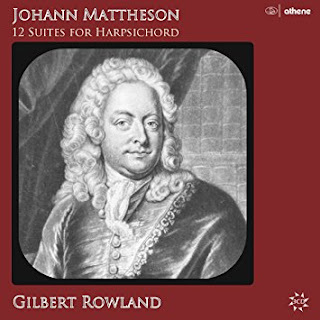 We get a solid look at his music for solo keys in his 1714 opus 12 Suites for Harpsichord (Athene 23301 3-CD set) as spiritedly and authentically realized by Gilbert Rowland. The liner notes for this release tell us that he lived in Handel's time and indeed was a friend of his. He composed, played organ, wrote, danced, fenced and was multilingual. His friendship with Handel suffered a setback when they fought a duel over Handel's involvement in a performance of Mattheson's opera "Cleopatra." Happily no one was hurt and their friendship resumed. His operatic career as singer ended when he became the secretary for the English Ambassador in 1705. By 1715 he was Music Director at Hamburg Cathedral. Increasing deafness forced him to give up that position in 1728. He composed numerous choral works during that time, but tragically much of his music has been lost to us during the bombings of WWII. The liners reassure us that the opera "Cleopatra" survives along with a good deal of instrumental works, one of which of course is the "12 Suites" that forms the whole of the current release. The suites combine homophonic and contrapuntal elements, and are made up of dance music and pure movements that serve to introduce and connect the whole of each suite. In that they were like Handel and Bach's forays into this mode, but also you can hear at times a French element, a similarity to Rameau in the briskly kinetic but lyrical effusions. The "12 Suites" establish for us Mattheson's idiomatic immersion in the baroque of his time but also a definite originality. The music comes alive thanks to Gilbert Rowland's apposite and enthusiastic performances. The set will appeal to anyone who revels in baroque harpsichord. Mattheson may be tragically obscure these days but he is undeservedly so. The "Suites" give you many reasons to listen and enjoy. Take the plunge on this one, should you be so inclined. I do not think you will be disappointed. I for one am glad to hear and in the future re-hear these unknown gems! Arthur Rubenstein did more to introduce Western audiences to the piano music of Poland's brilliant composer Karol Szymanowski (1882-1937) than anyone alive in the 20th century. If today his music is not as frequently performed as it might be, the masterful quality and expressivity of the oeuvre as a whole demands a serious immersion in the best of it if we are to understand the 20th century musical strengths and poetics of Eastern European classical-modernism. Barbara Karaskiewicz combines virtuosity and interpretive acuity to be a near ideal exponent of a series of breathtaking Szymanowski works in her volume of his Piano Music (Divine Art 25151) that has recently become available. What makes this album especially attractive is its intelligent mix of early and later works. The "Nine Preludes, Op. 1" and the "Four Etudes, Op. 4" are followed by the later "Masques, Op. 34" and the "Two Mazurkas, Op. 62." The earlier music has something of the late romantic virtuoso brilliance that so overtook the musical sensibilities of 19th century piano music via Chopin and Liszt. Even then though the Szymanowski "Preludes" and "Etudes" included here have a distinctively original individuality and a zeitgeist reflecting the winds of change blowing transformatively over Europe and the music of the era. By the time the composer completed his "Masques, Op. 34" and his "Two Mazurkas, Op. 62" there is a distinct movement toward a 20th century modernism conjoined with his ever-prevailing rhapsodistic and poetic demeanor. The early and later phases of Szymanowski's piano music as we hear them on this album are not a matter of a contrast between tentative student works and mature mastery. There is a stylistic shift to be followed, surely, but the whole of this music shows a full command over pianistic resources and an highly inventive originality that sings out from first to last. 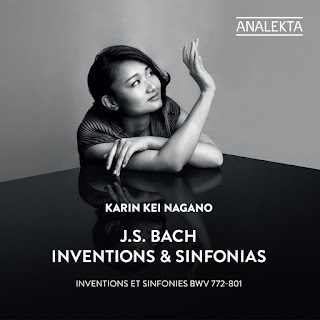 Ms. Karaskiewicz puts a sense of clarity and passion into each movement, a genuinely sympathetic lyrical and dramatic touch that is so needed for a vital interpretation of this most expressive composer. The end result is a very happy meeting of pianist and composer. I would be hard-pressed to imagine a better single CD that brings to us all that makes Szymanowski's piano music important and movingly alive. Here is a great place to start if you want to know why the composer is a central figure in the Polish early modern period. The selection and performances are equally rewarding to one who already knows something of the music. Barbara Karaskiewicz puts it all before us in glowing terms. Do not hesitate to grab a copy of this album! Electro-acoustic music, in its "electronic music" and "musique concrete" incarnations, was one of New Music's most potent and advanced gestures from the '50s through the '70s. There were even best selling albums such as Walter (Wendy) Carlos' Switched on Bach. And then, almost as quickly, Electronic Music went out of fashion for a time, Nevertheless the Millennium and beyond has brought a resurgence. 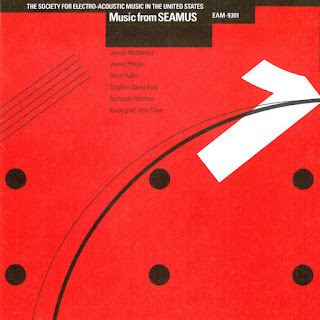 Music from SEAMUS (EAM-9301) documents the electronic pre-Renaissance, in a first volume of works released under the auspices of the Society for Electro-Acoustic Music in the United States. It covers the period between 1980 and 1991, a somewhat dark time for the reception of such music but as we hear on this volume, a time when excellent work was still being produced. The six compositions on the anthology give us a window on some state-of-the-art developments. Four works feature conventional instruments (and voice in one example) and processed and/or synthesized electric sounds. Two are works for electro-acoustic forces alone. The stylistic parameters fall rather squarely into a high modernist and beyond sound color and open-form expansive orientation. On the works for instruments and electroacoustics there is a consistent attempt to extend the scope of acoustical instruments with synergies between the two realms. The all-electroacoustic works develop aural landscapes of varying densities. For your information, the following is a round up of the composers, works and configurations: James Mobberley opens the program with his "Spontaneous Combustion" (1991) for alto saxophone and computer generated accompaniment; it is followed by James Phelps and his "Chordlines" (1991) for computer-generated tape; next up is Anna Rubin and her "Remembering" (1989, rev. 1993) for soprano, piano and tape; then follows Stephen David Beck and "Improvisation on Strange Attractors v1.0b" (1990) for bassoon and Virtual Instrument Paradigm; Bernardo Feldman and his "Still Life" (1986) for tape follows; the concluding work is Kwok-ping John Chen's "Ring Shades" (1990) for solo percussion with two-channel tape. What we experience on this volume are a series of works that deserve fully a hearing today. They should not bask in the obscurity that has been the fate of much electro-acoustic work towards the end of the twentieth century. Anyone interested in the history of later New Music will find this enlightening. Anyone with open ears will find the hearing of it all pleasureable. Give it a listen, by all means. 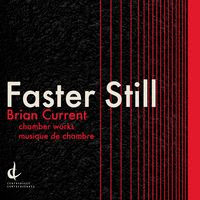 Brian Current, a living Canadian composer, manages on his CD Faster Still (Centrediscs 24217) to toggle between high modernism (in his advanced whirlwinds of colorful execution and sometimes advanced, edgy tonality) and postmodernism (in his use of tonality and sometimes in the notefull presentation). As a composer of his time, he is not afraid to mesh modern and postmodern elements in a single work, so that virtually anything can and does happen in service to the aesthetic whole. All this on the multistranded chamber works written between 1996 and 2016. Current comes at us like a force of nature, of irregular eddying torrents of wind or water, with clusters and deft collisions of notes and sound colors. All happens via a series of five provocative chamber works and a bonus concluding work for chamber orchestra. There is a freshening to be heard throughout. None of this is precisely predictable; most of the works are unexpected in their post-Boulezian motility, like particles hitting one another at high speeds in a collider or wafts of coloristic atmosphere formation. The opening "Inventory" (2006) sets the pace with an excitement generated out of soprano Patricia O'Callighan's pleasing virtuosity and the flowing sureness of the chamber orchestra Slipstream. This is marvelous music, built through a genuinely insightful layering of idiomatic part writing and the effect the totality has in generating movement. From there it continues fruitfully and vitally. The remaining four works are all distinctive and brilliant. If I only cover what I generally like on these pages, please rest assured I like CDs such as this with a heartiness that is in no way feigned. So if I might be so bold as to suggest, Faster Still will engage and delight virtually anyone who favors the new and the inventive possibilities still available to our collective musical senses. Brian Current is the real thing and this music makes for essential listening. Anyone who for some reason does not know Erik Satie's piano music has been missing out on a singularly wonderful thing. I've listened for so many years to the bulk of it that it has entered my being as something eternally internal to me. I still have the old LPs of the Frank Glazer Vox Box, the Aldo Ciccolini volumes on Angel/EMI, and lately the Jeroen van Veen CD set on Brilliant (see my review here from last October 6, 2016). 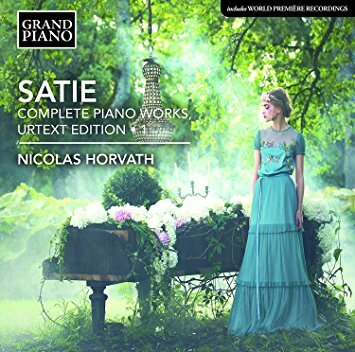 And now we have Nicolas Horvath playing Cosima Wagner's 1881 Erard Grand (the make of piano that Satie favored) for Volume One of the Complete Piano Works in the new corrected Salabert Edition of 2016 in its World Premier recording (Grand Piano 761). The Glazer version is the most middle-of-the-road in its clean depiction of the scores, the Ciccolini is the must sparkling and impressionistic version, the van Veen is the more radically iconoclastic of all of them, featuring very slow, sensuously beautiful versions of the lyric masterworks and adventurous readings of the other works. And so what of Horvath's new set? Of the Volume One? The Erard gives us a sort of pale, brittle vulnerability to the lyric works, most of which are a part of Volume One. We get Gnossiennes, Gymnopedies, Sarabands, the "Sonneries de la Rose Croix" and other gems both very familiar and less so. Horvath's interpretations are meant to be faithful to Satie's vision and as such they are not spectacularly slow or fast, not extrovertedly dashing so much as concentrated. The Salabert Edition corrects the numerous errors that crept into the printed versions of the works, some because Satie did not proofread the printed galleys as carefully as he might, and others for whatever reason. I cannot say that my well-accustomed Satie ears perked up and lead me to a pronounced "wow" at any particular point in my listening, but nonetheless it is always a good thing to get the music closer to what Satie intended. The wealth of lyric pieces combined into the First Volume along with the sterling interpretations make this an excellent place to start for anyone who does not know Satie well. For the cognoscenti this new set promises to be another offering of finely poetic interpretations that completists or enthusiasts will want to have. Frederick Delius (1862-1934) and Edward Elgar (1857-1934) were contemporaries and peers, yet on the surface had not much in common save their mutual English roots. Elgar in his own way accentuated the classical-romantic heritage and made of it something personal as well as something English, with a certain Victorian propriety that does not necessarily mar his inventiveness as it serves to frame it as of his time. Delius followed a personal path that veered at times closer to impressionism without sounding derivative. And his music was often enough sensuous in ways that Elgar's work generally was not. In that sense Delius seems less tied to his period, though none of it sounds exactly "modern." The contrasts are clear yet there is a commonality to be heard as well in their String Quartets (Naxos 8.573586). The Villiers Quartet give us considered and very poised versions of the two works. Both were a product of the disruption and cataclysm of WWI. 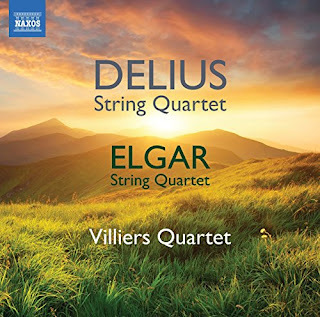 Delius favors an unremittingly pastoral beauty, Elgar a more robust moving on at least in the outer movements. The Delius Quartet originally took shape as a three movement work in 1916. He subsequently gave a thorough overhaul and created a four movement version in 1917. For the first time in a recording we can hear the opening and "Swallows" movements in the original form, as reassembled by Daniel Grimley in 2016. They follow the final four-movement version on the CD, giving us a rare chance to see Delius's creative process at work. And there is such visceral, sensuous beauty in the Quartet that a differing reprise of the first part of the work serves to prolong the pleasure of its quiet serenity. The Elgar Quartet that follows is a notable example of the mature composer on a serious side, which by then was mostly how he proceeded in any case. 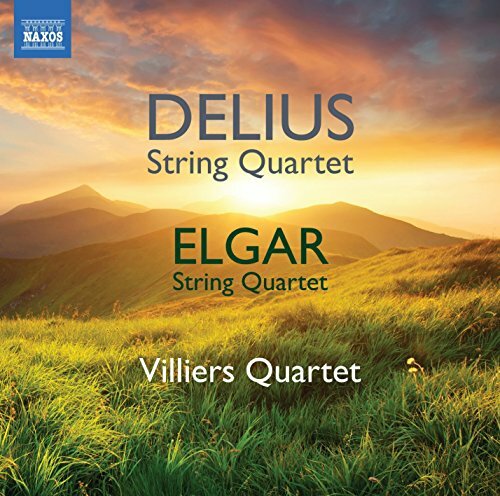 Perhaps what is surprising about the Quartet is how it goes with the Delius. It has more robust outer movements, but there is a lyrical serenity in the slow movement. There is a more overt romanticist sentiment, surely. But the work as a whole is not entirely alien to a pastoral setting. It is as if each reacted to the waning World War with a kind of reassertion of what true peace meant to them. The Villiers Quartet bring out the beauty and transcendence of these two pivotal works. I am left after hearing the recording multiple times with a feeling of deep satisfaction with the rightness of both music and performance. So I recommend it to you without hesitation.